Throughout the academic year, UofT Music offers weekly Tours for Prospective Students . Other special events include: Fall Campus Day, March Break Tours and our Jazz Primer Workshop Series. General UofT Campus Tours. are also offered throughout the year. Thank you for joining us at the Faculty of Music on Saturday October 20, 2018 for our Fall Campus Day open house for prospective undergraduate students! Information regading our 2019 Fall Campus Day will be posted here as soon as it is available. For details regarding music related events and tours which took place at our 2018 event, please see our Faculty of Music Fall Campus Day Schedule 2018. We look forward to seeing you at our next event in October 2019! The University of Toronto Jazz Studies department is offering a 4-part Primer Workshop Series for prospective students considering post-secondary Jazz study. The workshops will be run by UofT Jazz faculty, many of whom are top performers on the Jazz scene today. 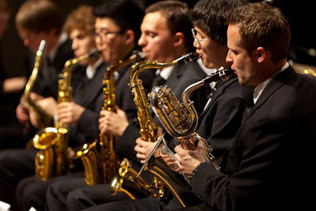 There will be direct interaction with UofT Jazz students, who can answer questions about their experiences and life as a jazz student at UofT Music. Dates: October 27, November 24, January 19, and May 4. If you are under the age of 18, consent will also be required from your parent or guardian. Details regarding consent will be sent to them directly once the online registration form has been submitted. Drop-in tours of the Faculty of Music will take place on Mondays and Fridays from January 11 - April 5, 2019. These tours offer prospective students the opportunity to get a feel for the Music Faculty and its environment and to ask questions about life as a Music student. Questions may be directed to us at: undergrad.music@utoronto.ca or 416-978-3741. *For groups of more than 10 people, please contact us at least 2 weeks in advance to ensure we are able to accommodate your group. Arrangements can be made by contacting Calista Biermans Tunney at: undergrad.music@utoronto.ca or 416-978-4889. Please note that the Faculty of Music will be closed on all Statutory and Civic Holidays. Come to a concert or have a tour of the Faculty during March Break! Drop-in tours of the Faculty of Music will take place Thursday, March 14, 2019 and Friday, March 15, 2019 at 11:10am, 12:10pm, 1:10pm and 2:10pm. These tours offer prospective students the opportunity to get a feel for the Music Faculty and its environment and to ask questions about life as a Music student. Please note that tours begin promptly at 10 minutes past the hour. For information on UofT Campus Tours, please click here.